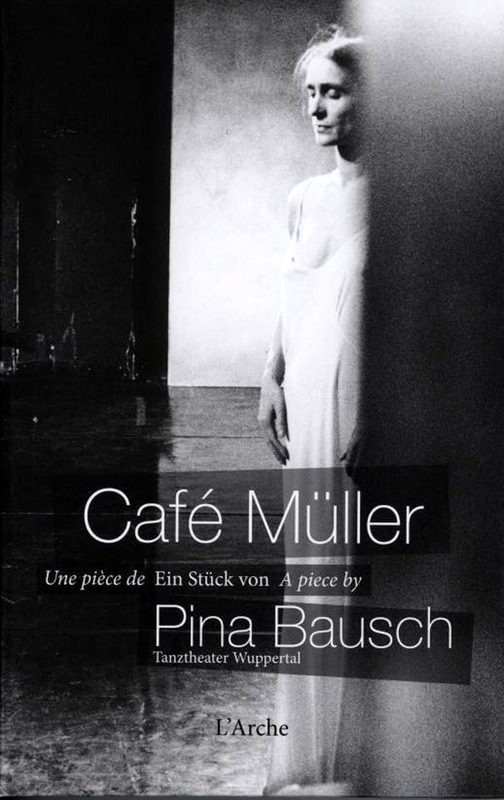 Café Müller was created and first performed in 1978, thirty four years ago: a fair distance in time. It still lives. This film of the dance (or the psychodrama, which may be a better description) was made in May 1985 at the Opera house in Wuppertal, then broadcast on German TV in December of that year. Pina Bausch directed the film and she’s on stage here too, taking the same role that she took in the original production, some seven years before. It begins with a lone woman dressed in an ethereal gown, edging into a cluttered room. There is very little space. Chairs are strewn around and she bumps into them: perhaps she is blind? To avoid obstacles, to stay safe from pain, she keeps to the wall, clinging to the margins. The woman is played by Pina Bausch. Another woman, similarly dressed, enters the room shortly thereafter and goes towards the chairs, which are (most of the time) cleared out of her way by a man. He watches over and makes a path for her, but he can become impatient with her fumbling. There’s an edge, a possibility of violence or desertion. One scene haunts the mind, still. A man holds a woman in his arms then drops her, whether through tiredness, carelessness or cruelty. At once she gets up and clings to him. Again he holds her, lifts her up into his arms but drops her. And again, after she falls, she stands up and clings to him. It is cruel, funny, pathetic, indescribably sad – all these at once. The cycle goes on for so long that eventually you pray for it to end, as all the while Purcell’s mournful aria (‘Remember me, but oh forget my fate!’) drives despairingly on. Of course, viewing Café Müller on DVD can never be the same as seeing it live on stage: your eye is curtailed, there are things you cannot see. Even so, in this form it still has the power to move and one advantage is that there’s time to reflect on its rich meanings. The publisher’s description of the DVD and booklet can be read here.